Are You Tech Savvy? Meet This Super Teen Who Has Created MAGIC For People On How To Use The Web. Ever heard of jumping words or remember Ishaan of Taare Zameen Par? Yes, that’s what people with dyslexia suffer from. Anand and his team have created an app called “Oswald” that helps people who suffer not only from dyslexia but also multiple impairments to browse the web easily. Anand along with his friend Nishant had participated in the AngelHack hackathon and won the Code4Impact award and that’s how they began. Hi! I am Anand. I am a 19 year old designer, developer and entrepreneur. 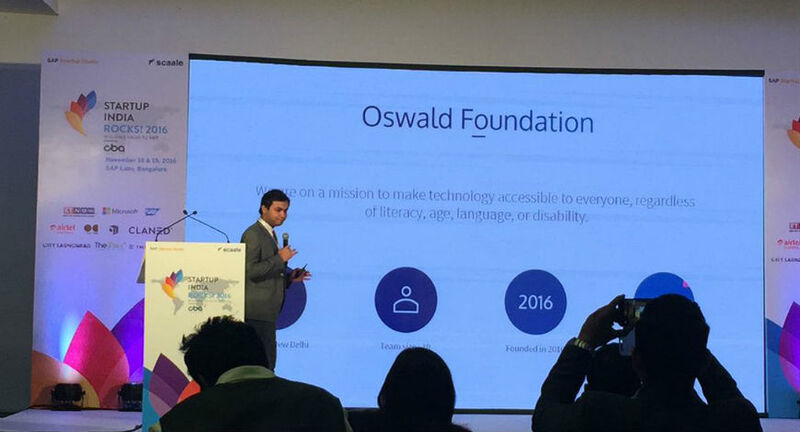 I lead an accessibility technology start up called “Oswald Foundation” where we build new technologies for the differently abled. I graduated from the Mother’s International School last year and dropped out of a design school in Ahmedabad and started this company. Next month we’ll be moving operations to Europe and I will study creative technology at the University of Twente, there. I am super excited to talk to you. 2) What was your first source of inspiration to start Oswald? I was working with a major e-commerce company on redesigning their parts of website. I noticed that major part of the website chunk is not friendly for differently abled persons. Websites don’t have necessary accessibility features for a large population ( over a billion) to use them. I believe that the best web is one that can be accessed by everyone and we are just getting started towards developing it accordingly. 3) Your team design products for patients with multiple impairments. How do you cater to the needs of each group of people ? We have divide our audience in four broad categories- the visually impaired, learning disabilities, senior citizens and the unlettered. For people with dyslexia, we have dyslexia- friendly mode which uses research verified by the British Dyslexia Association and the W3C for upto 65 % faster and easier reading. It automatically changes colour schemes, contrast ratio, typography and other unnecessary elements. We also have blue light filter for reading after sunset. It stimulates an adjustment to colour temperature of a users display to reduce eye strain and disruption of sleep patterns. For those who are visually impaired or illiterate we have built-in content extraction that reads it out for a partially or completely blind. It can translate a website’s content into a user’s language over-the-air before reading aloud, supporting 100+ languages. Our technology also adds screen reader’s support to all the webpages, right out of the box, plus keyboard shortcuts for navigation and read aloud features. 4) Tell us about the tech stuffs of Oswald. Valmiki- plug-in for web browsers like google chrome. It changes the look and feel of the entire internet based preferences. Shravan- It is the world’s first end to end smart phone. Our patent is still pending. It has Aadhar integration and works in native languages, with built-in voice assistant, music streaming, sports scores, one tap ambulance access. 5) What is the scope for research and development of your venture ? We originally got started with a 2012 Luz Rello and Ricardo Baeza- Yates for the world wide web consortium’s web accessibility initiative and I recently wrote an article about how we are using machine learning in Shravan. 6) How does your venture stand out amongst stiff competition in the market ? Fortunately we are one of the first accessibility technology companies working in India at a huge scale. I am very proud to say that the technology that we use in our products such as AutoALT uses computer vision to generate alternate text for the images or the speech and the vibrational interface for the smartphone. We are the only one’s doing it and I am very happy that we are contributing in making the world a better space for living. Multiple Startups | 1000+ Articles | The Untamed Blogger, CEO, Founder And A Proud Indian Pradeep Kumar !